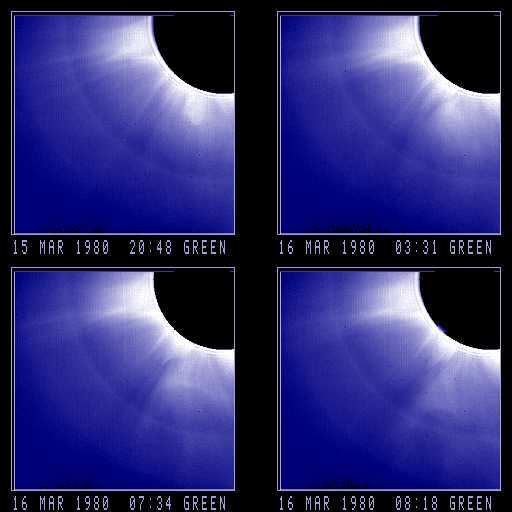 These four images were taken by SMM in the later stages of the coronal mass ejection and show the concave outward shaped core. The pinched-off appearance of the core is consistent with the structure having become magnetically disconnected from the sun. Solar north is toward the upper left. Cavity rises slowly in fan. Fuzzy loop becomes visible around cavity. Brighter tongue-shaped core follows cavity. Base of core is concave-outward, `U'-shaped by early March 16. Archetypal disconnection from ~6:05 until 10:46 UT on March 16. Fan is partially blown out. Deflections.